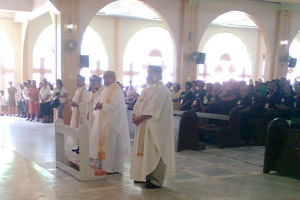 New pastors were installed to the Archdiocesan Shrine of San Vicente Ferrer! Msgr. Jose "Jojo" Dosado Jr. was replaced after "8 years and 6 days" of shepherding the people of God in Bogo. As his replacement, Rt. Rev. Msgr. Isidro "Dhodong" Ullamot was installed last Friday, November 19, 2010. 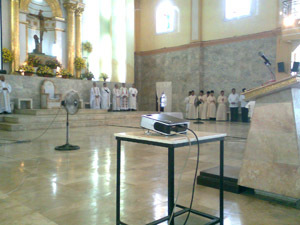 3 other priests; Rev Fr. Divino Jurcales, Rev. Fr. Jermaine Lecciones and Rev. Fr. 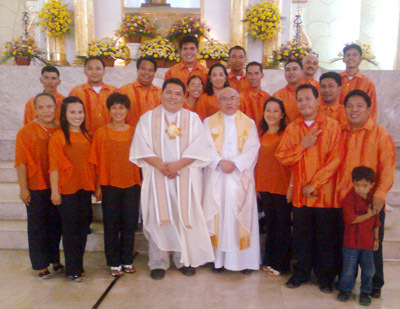 Armand Urhuela were also assigned in Bogo and were standing beside Msgr. Ullamot during his installation officiated by Rt. Rev. Msgr. Cayetano M. Gelbolingo. Msgr. Dhodong Ullamot and Fr. Dave Jurcales are the new parish priests (Team of Pastors) while Fr. Armand and Fr. Jermaine are the parish vicars. 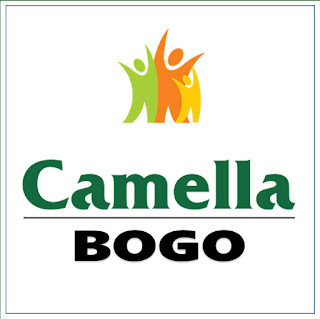 This is the second time that Bogo's SVF church was given a team of pastors assignment. 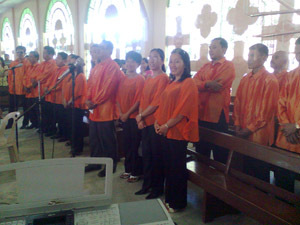 The first team of pastors in Bogo was intalled last November 12, 2002 composed of Rev. Msgr. Jose "Jojo" Dosado, Rev. Fr. Eligio "Elly" Suico and Rev. Msgr. Phil C. Tumulak. Msgr. 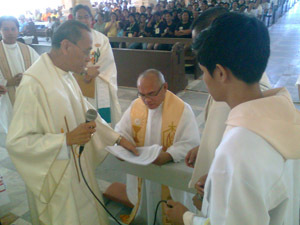 Phil Tumulak was later reassigned as Episcopal Vicar of the Near North District of the Archdiocese of Cebu and at the same time Parish Priest of Danao City. Fr. Elly Suico also was sent by the Archdiocese of Cebu to the Vatican City for further studies. The City Government of Bogo also witnessed the installation, in fact the Bogo City Employees Chorale, a choir composed of purely city hall employees was the choir during the installation who was later thanked by Msgr. Ullamot with his "par excellence performance" comment. Other priests also concelebrated the Mass of the installation. Some parishioners from Mabolo Cebu City were also present. Msgr. Dhodong Ullamot was assigned in Mabolo prior to his assignment in Bogo. After the Mass, a sumptuous lunch for the visitors was served.